Whether you eat sweet corn raw, messy, on or off the kernel, growing sweet corn with the following advice will make it easy for you. The best sweet corn is delicate and sweet. You don't want to chew bland cardboard, which is the problem that occurs with a much of the sweet corn that's been stored and sold in shops. Sweet corns are at their sweetest just after they're picked. The height of their natural sweetness lasts for approximately an hour and then the sugar starts converting to starch. That's why home grown cobs are usually the best you'll ever eat. Compared to other home grown vegetables, sweet corn doesn't require a lot of attention. Just a few things need to be done correctly and regularly. However, the most important factor is the soil. Here's a guide on how to grow sweet corn with perfect soil conditions. Sweet corn can grow in many types of soil, but keep in mind is that the soil should have enough moisture and be well supplied with humus for good results. The best soil for planting sweet corn is slightly acidic with a pH range of 5.8 to 7.0. Before planting, your soil should be fertile and been allowed to dry slightly at some stage. This helps in eradicating the spreading of soil-borne pathogens that might have been left over from previous plants. A good idea is to prepare the ground the previous autumn or winter and add compost to enrich the soil. A bit of history on growing sweet corn first: Sweet corn can be classified into two broad varieties — the open pollinated variety and the hybridtypes. 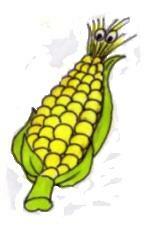 There are three factors sweet corn varieties are generally categorized by. These are: color, date of maturity and sweetness. Kernels can either be bi-colored (a mix of white and yellow), white, or yellow — and color is no indication for sweetness. To get the best results when growing sweet corn, plant your corn patch in a square configuration, or at least a double row. This is essential because sweet corn depends on the wind for pollination and this works best when cornstalks are close enough to touch each other. If you're planting the seeds in soil that is cool and moist then it's wise with sweetcorn seeds to dip them in an organic treatment first to stop fungi, or buy treated seeds. If you see the corn leaves curling, make sure you water immediately as that indicates a lack of water. It's always better to water the crop well everyday or other day to prevent drying out. Cutworms can be extremely harmful; however, due to their unpredictable nature they don't always actually cause damage the growing sweet corn.